According to the SF Chronicle, the recent American Recovery and Reinvestment Act will channel millions of dollars to several bay area national parks. Projects targeted for funding include rerouting of the Dias Ridge Trail in the Marin Headlands, structural upgrading in Muir Woods, demolition of old buildings at Fort Barry, and the construction of trails, overlooks and exhibits at the new Giacomini wetlands. One last local item: campground rehabilitation at Tomales Beach. Tomales Beach is not part of Tomales Bay State Park -- it is on national park land on the bay side of Point Reyes, between Marshall Beach and the elk reserve, well north of the state park. The beach is accessible only by kayak. Here's a map of places on Tomales Bay where boat-in camping is permitted. How great that Point Reyes provides so many opportunities for boat-in and hike-in camping. What a shame there is no car camping anywhere on the peninsula. You used to be able to pitch a tent at a walk-in campground at Tomales Bay SP, but no more. 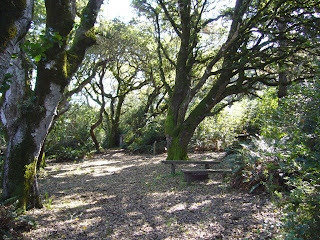 I don't know why or when the state park campground closed, but the campsites are still there, tucked under a dense canopy of coast live oaks, mere steps from the parking lot (but unsigned and unadvertised in any way). Since the campground is unmaintained, before long ferns and huckleberry will grow over the wood picnic tables and the site markers will rot. With the state of California's economy, we'll probably never get to make use of the easiest camping on the Point Reyes peninsula.